A pilgrimage to the Holy Sepulchre of Our Lord and to the other sacred places is also an act of solidarity with our brothers and sisters living in the Holy Land. Our presence among them is an encouragement to the Christian minority in that land, among so many problems, pressures and difficulties. Also, a deepened faith that comes from experiencing the Land of the Bible and its people enables pilgrims to give special witness to those with whom they live and work. The Pilgrim Shell is the most prized decoration of the Order of the Holy Sepulchre. It is awarded to Knights and Ladies who complete a pilgrimage to the Holy Land that includes visiting works of the Order, education on the situation among the Catholic population in the Holy Land and praying at the Basilica of the Holy Sepulchre. Normally it is presented by the Latin Patriarch of Jerusalem, or his representative, and consists of a scalloped shell in silver in the center of which is placed the Jerusalem cross in red, bordered in gold. Originally, the symbol of a complete pilgrimage to the shrine of St. James the Apostle at Compostela, Spain, the shell is now the universal sign of pilgrimage. The shell reminds us that we are all pilgrims on earth and members of a pilgrim Church. It is also a pledge to aid the needy, especially in the Holy Land. In this 10 minute video, join members of the Order as they make their own pilgrimage. April 29, 2019 – May 10, 2019 This pilgrimage to the Holy Land will be conducted under the Spiritual Direction and Leadership of Deacon Sir Ryan Adams KCHS, Lady Wynsdey Adams LCHS, and Rev. Sir Jeff Baker, KHS. Click here for the brochure with full details, itinerary, and registration. Deadline to register is January 29! October 30, 2019 – November 10 , 2019 Hosted by the Equestrian Order of the Holy Sepulchre of Jerusalem – Western USA, Honolulu Council. This 13-days pilgrimage is under the Spiritual Direction of Rev. Sir Lane Akiona, ss.cc, KCHS. Fr. Akiona invites all members to join him. “It is my hope that this pilgrimage provides an opportunity for pilgrims to see and experience sites that were made holy by Jesus.” Click here for the brochure with full details, itinerary, and registration. October 30, 2019 – November 10 , 2019 Make a Pilgrimage to the Holy Land under the Spiritual Direction and Leadership of the Most Rev. Sir Marc Trudeau, KHS. The group coordinators are Sir Tod and Lady Louise Tamberg. Click here for the brochure with full details, itinerary, and registration. 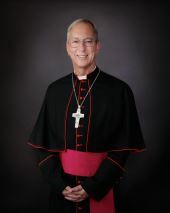 Scroll below to read a special invitation from Bishop Marc Trudeau to join this pilgrimage. March/April 2020 Rev. Sir Stephen Porter and Lady Jenny Campbell are cooking up a Pilgrimage to Italy, featuring Assisi, and Rome, with a visit the EOHSJ headquarters in Rome and a couple other very special visits. Dates are pending and will be announced soon – likely to be in the March/April 2020 time frame. October 12, 2020 – October 24, 2020 Pilgrimage is under the Spiritual Direction and Leadership of Monsignor Gregory W. Gordon, KHS. Group Coordinators: Sir Joe Micatrotto, KCHS, & Lady Connie Micatrotto, LCHS. Brochure available after December 24, 2019. October 26, 2020 – November 5 , 2020 This is the Archdiocese of Los Angeles’ Official Pilgrimage to the Holy Land. It will be under the Spiritual Leadership of Archbishop José H. Gomez, KC*HS. The Group Coordinator is Lady Judy Brooks, LHS. Brochure available after January 5, 2020. A little more than a year ago, as I was preparing to leave on a pilgrimage to the Holy Land, I received word that Pope Francis had appointed me to serve as an auxiliary bishop in the Archdiocese of Los Angeles. I am planning to return to the Holy Land for the first time since my episcopal ordination, and would like to extend a personal invitation to each of you to join me on this special pilgrimage, Oct. 30-Nov. 10, 2019. We will be hosting an informational meeting for our pilgrimage at St. Pancratius Parish, 3519 Saint Pancratius Place, Lakewood, on Sunday, May 5 at 3 pm. Please join us for this important meeting! This is an EOHSJ-hosted pilgrimage, which means we’ll experience the local Christian community in ways a lot of pilgrimages aren’t able to do. We will celebrate Mass in the Holy Places; meet and pray together with our Catholic brethren in the Holy Land; and, we will witness the good works being done by the various ministries and services our Order supports in the Holy Land. We are already receiving numerous inquiries, so if you are thinking of joining us, please be sure to sign up by June 1. If you wish to make your own airline arrangements, there is an option to purchase only the land portion of the pilgrimage and connect with us over there on the first day. If you have any questions, please contact Sir Tod Tamberg, KHS, at accmed14@hotmail.com or (213) 216-8395.